Text Paster pastes and automatically enters plain or formatted text into any program: greetings, generic replies, the current date and time, letter and document templates, e-mail and website addresses, usernames, passwords and more. If you are tired of typing the same text multiple times, Text Paster can help you! 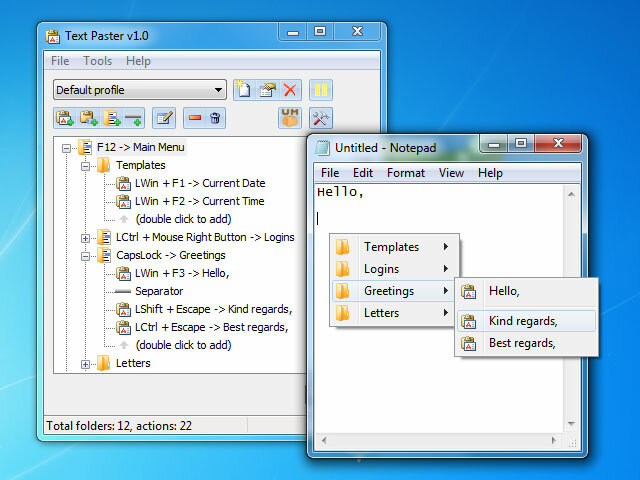 Text Paster is a program for instantly pasting into input fields in practically any program simple or formatted (RTF) text that has been pre-defined by you: standard phrases, greetings, generic replies, the current date and time, letter and document templates, e-mail addresses, website addresses, usernames, passwords, text fragments selected on your screen, clipboard contents, and much more. You can also do the following with Text Paster: - Group the text clippings you regularly paste and display them as a popup menu. - Paste text or display a popup menu with a single key, mouse click, key combination, or by pressing and holding a pre-defined key or mouse button. - Quickly fill out forms thanks to automatic switching between fields through emulation of the Tab key and other keys, including Enter. - If a program does not support pasting text (for example, a console application), then text can be typed in by the program itself. - Limit text pasting and type to certain programs or windows. Total PDF Converter OCR converts scanned PDF files into editable Word, Excel, TXT, CSV documents. A powerful text recognition technology guarantees perfect results. Both user interface and command line. Download your free trial copy now. Simpo PDF to Text is an easy-to-use PDF to Text Converter, PDF to Txt converter, it can convert any Adobe PDF files to plain text formats. Manage articles, ebooks. Read RFC documents in pretty format. Simpo PDF to Word Converter makes it easy to reuse PDF contents, such as text, images and tables, by converting it to editable Microsoft Word. Users can convert a batch of encrypted PDFs to Word at a time and convert selected pages of a PDF document. This software offers a solution to users who want to split CSV files into smaller files. Files can be split by user-defined number of lines or character content criteria. Batch Text&Html Editor is an Easy-to-use software for Win32 platforms. It batch edit text or html files. This site does not contain serial number, crack, keygen Text Paster serial number : serial number is the simplest type of crack. A serial number(cdkey,product key,etc) is register the program as you may already know. a crack or keygen may contain harmful software. If you cannot find the exact version you want, just give it a try. for more information read .nfo/.txt/.diz file include in zipped file.